As you add up lenses and accessories to your underwater photography or compact video rig you start experiencing an increase in weight first on land and afterwards in water. My current rig for photography weights in excess of 5 Kg (11 lbs) and in water this is very near to 2 Kg (4.4 lbs). The housing and the hardware are usually the main culprit but even strobes or lights can easily add weight. As you add more and more components the weight of your rig ramps up. I use locline arms for video and this greatly helps reducing weight both in and outside water. My compact video rig is around 500 grams or 1.1 lbs in water but also very lights outside water. The Sola lights really help with their incredibly compact size. The heaviest items are the tray and handle and the lenses. 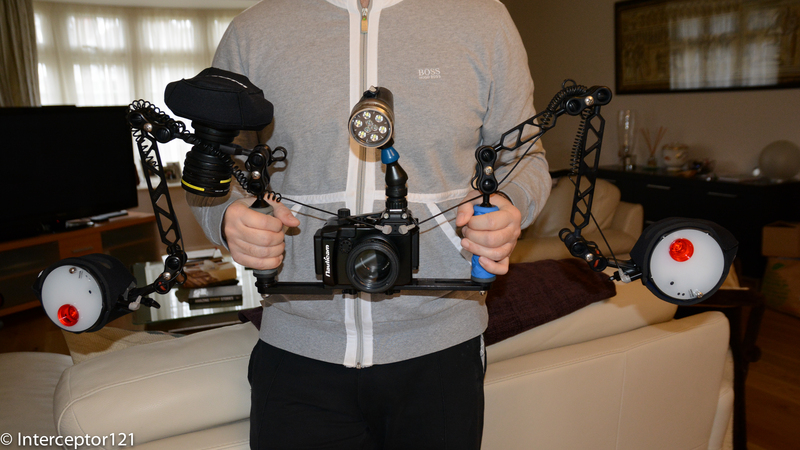 For my video rigs I use STIX jumbo floats on the tray and on the locline segments. Each one of those floats gives around 160 grams 5.6 Oz lift in water. For stills I use aluminum arms as I find them more precise but also need longer arms and be able to sustain a heavier weight for a strobe outside water. Strobes frequently weight over half a kg with batteries, this is too much for a 1/2″ locline arm and stiffer 3/4″ segments are required. I don’t particularly like the 3/4″ segments and I prefer ball and clamp solutions. 3/4″ segment can hold easily a strobe but can’t be really too long. Even in this case I tried to use as many floats as possible to keep it light around the usual half Kg 1.1 lbs underwater weight. 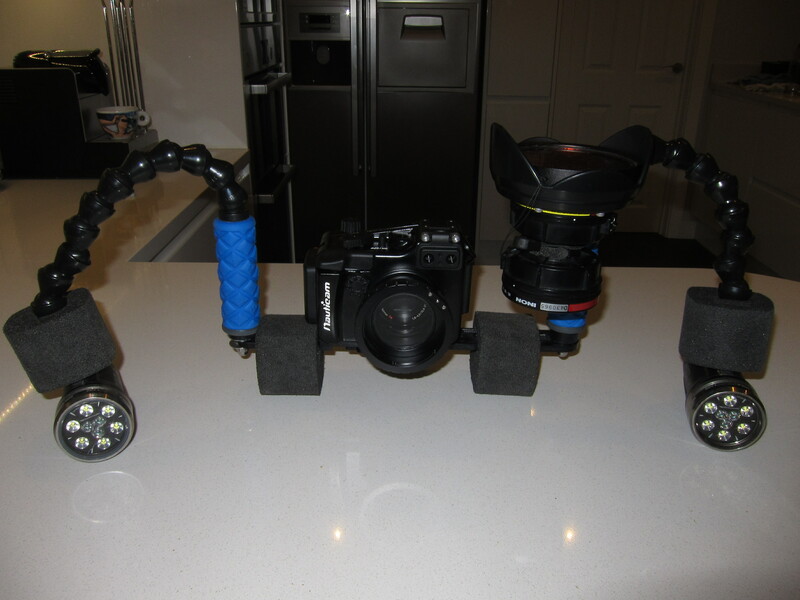 For my RX100 I have two strobes and arms with 8″ and 5″ long segments. As you can read this is 5.5 Kg on land and even with 6 Jumbo stix floats the underwater weight is over 680 grams or 1.5 lbs this for me is a bit too much to carry around so I started looking into alternative solutions. The ultralight buoyancy arms provide too little lift in my opinion to be worth using so I looked at float arms in carbon or plastic material as an alternative. 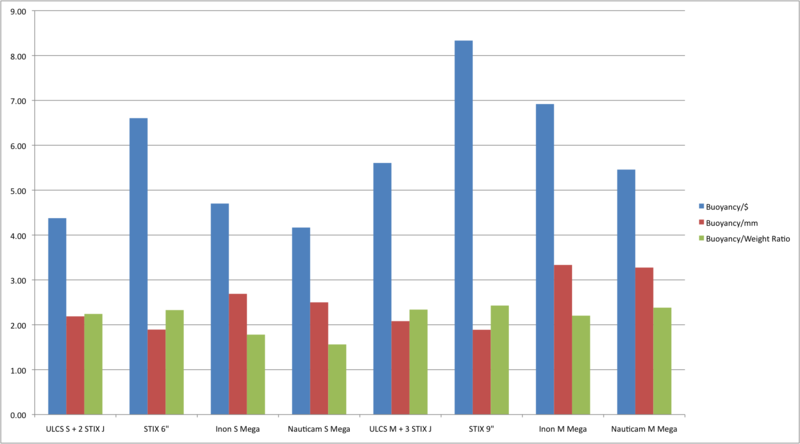 I came across Inon and Nauticam products and so I ran some comparison based on some metrics I have defined myself. Update 16 March I also include Stix float arms now. 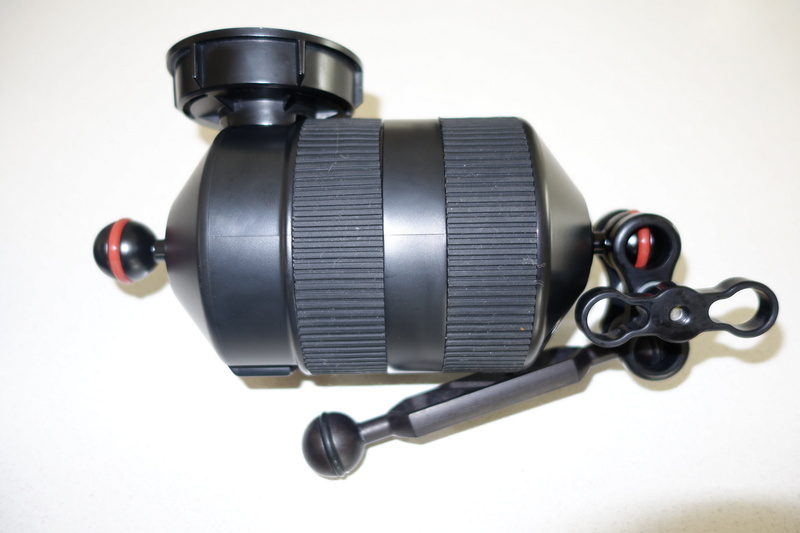 You would use standard float arms if you have an acrylic dome on an SLR or mirror-less or a plastic housing that gives considerable lift as those solution give limited lift in water ranging from 75 to 333 grams. 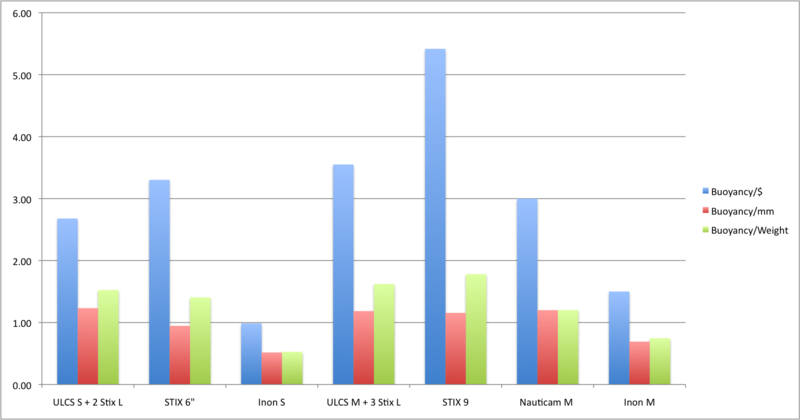 I have compared an ULCS 5″ and 8″ segment with Nauticam 60 mm diameter and Inon arms of the same diameter 52 mm or 2″. Those are the results. Update the new graph also includes Stix arms made of aluminum with plastic balls and their own floats. In this category you can see that a STIX arm with large floats beats a carbon or plastic float arms on all metrics in fact on the shorter segment nauticam does not even produce a float arm solution. An ULCS 5″ segment with 2 large floats give a lift of 154 grams or 5.4 Oz and an 8″ segment a good 237 grams or 8.5 Oz, Stix arms offer 142 and 260 grams respectively in the 6″ and 9″ lengths. This solution gives more lift in water and is lighter on land I see no benefits investing in a float arm in this range of buoyancy and for this reason I have not even considered ULCS buoyancy arms. A pack of large stix floats costs $25 for 4 units of 99 grams or 3.5 Oz lift each and those can be moved on your arm segments making it a very flexible option. I define as mega floats anything that offers at least 2 grams lift for each mm effective length. I put the Stix arms in this category even if they fall short in this metric as they are comparable and cost effective. Each one of those solutions will provide in excess of 274 grams or 9 Oz lift in water. In this category we have the ULCS arms with Stix jumbo floats as the most agile solution at 2.5″ or 63.5 mm diameter, this has the benefit of not requiring extra long clamps to fold two segments with floats fully. 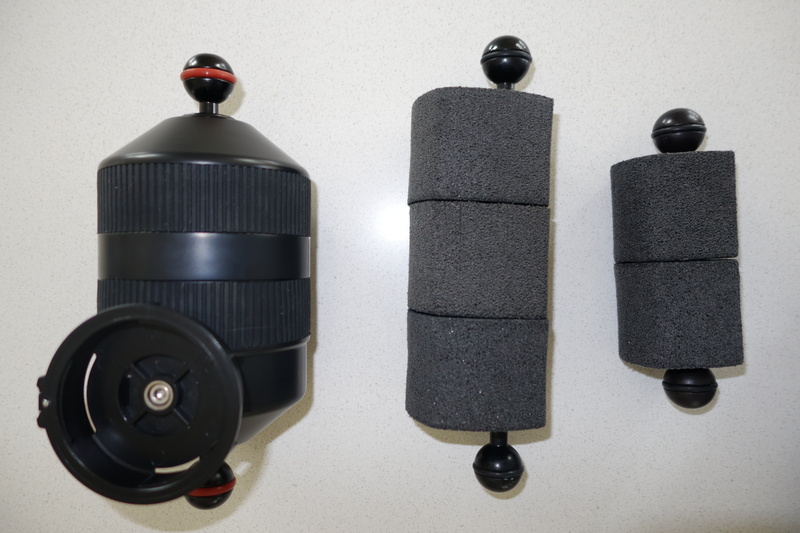 Nauticam and Inon both have segments with 90 mm and 97 mm diameter. Inon segments have an extra benefit compared to Nauticam for compact camera users using wet lenses as they can support up to 2 single lens holder for each segment as in the picture earlier in this post. Stix arms made of plastic are the cheapest in this category though can’t offer the same amount of buoyancy of carbon or ABS arms. Stix float arms score higher on a Buoyancy/$ metric and also lead the way in terms of buoyancy/weight ratio however the amount of lift offered is limited and this solution does score low on the buoyancy/mm metric. Especially in the medium segment around 8/9 inches you can see that there is not much difference on a buoyancy/$ between a 9″ stix arm and an Inon M mega. You do get a problem with this big arms if you want to fold the segments on themselves. Currently ULCS provides the AC-CSB clamp for 2″ arm segments but even with that you can’t fold two mega arms. Ultimately I do not think is a big issue as you can use the strobe adapter segment and still achieve all possible positions for your light anyway if you are concerned do get a couple of the longer clamps. Unless you have a plastic housing or a housing nearly neutral in water floats or float arms at 2″ diameter are not really effective, produce limited lift and are not a really cost effective way to add buoyancy to your rig. 2″ floats can be used to trim your rig in case larger floats are too buoyancy but are not a primary way to achieve the purpose. For example if I wanted to make my rig neutral I could add 2 large Stix floats on each arm. Stix floats offer a lot of flexibility as you can take them off arm segments and put them elsewhere in a flexible way. Stix floats are also an option just within recreational limits 40m/130ft past this depth the floats loose buoyancy and eventually crush. Stix do offer custom materials float that resist greater depths on request. Mega arms are a bit clumsy but do provide the lift needed and are cost effective even if a bit heavy on land. 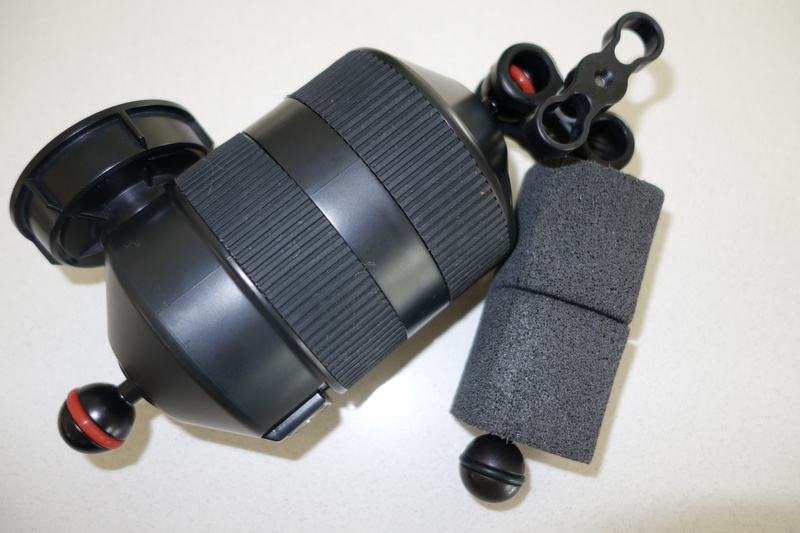 My preference if you use wet lenses is for the Inon arms, those are the most cost effective and provide the most lift and can also support lens holders. 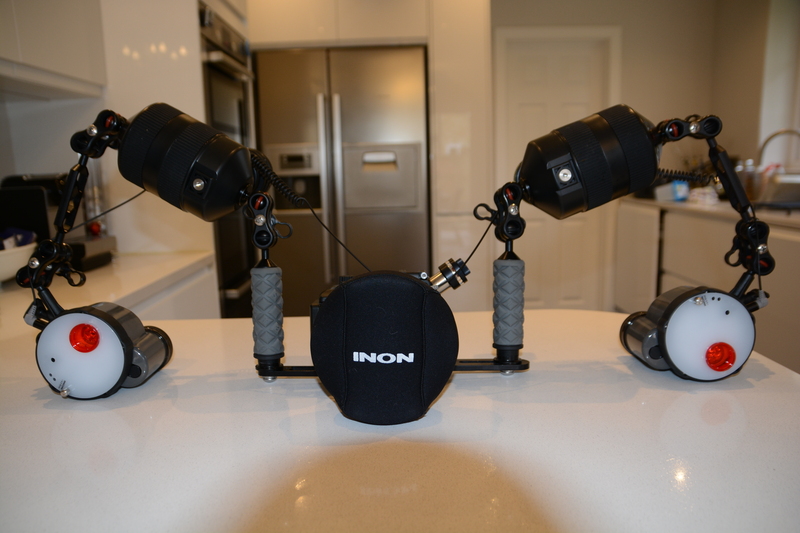 Inon arms are rated for 70 m/230 ft if you go deeper you need the Nauticam arms that ca go down to 100 m/330 ft. 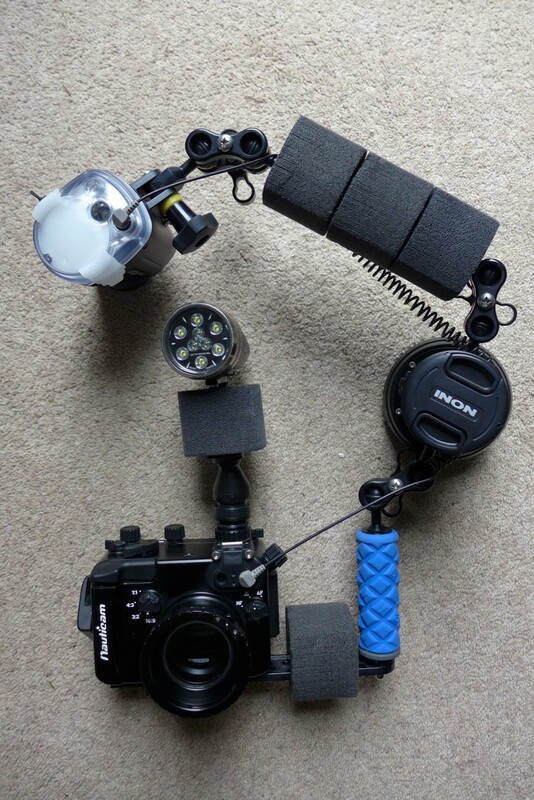 So for technical photographer float arms are really the only way forward in terms of off the shelf solutions. Obviously you can get bespoke solution using submarine grade divinycell but that is beyond the expertise and reach of a normal user. How much lift do you need? To calculate the buoyancy of your rig you can use manufacturers data sheets (Inon is brilliant, ULCS does provide some weights, housing manufacturers usually don’t). Failing that you can calculate this item by item using a graduated measuring container or last resort put your whole rig in water and use a luggage scale.